Proof that my inner child has excellent taste. Yep, other sewing bloggers make Chanel-style jackets with all sorts of fancy tailoring, I make goofy pink hoodies with cartoon cats on them. I LOVE THIS, you guys. It’s so soft and warm (and I have been informed by a reliable source that I am extra huggable while wearing it), plus it’s bright and colorful and I really like how the colorblocking turned out. AND it has this super-warm hood with EARS. When I started this hoodie, I figured it was just a fun, goofy thing that I’d wear around the house, but it actually turned out much cooler than I anticipated. I omitted the front pocket and the bottom and sleeve bands (plenty of length without using the bands). For the colorblocking, my arrangement of pieces was guided by how much fabric I had. I had only one strip of the Hello Kitty fleece–11″ x 60″–and only one of its long edges was straight, so the strip went down the front and back with the straight edge toward the center of the pullover. (I got really lucky and had just enough to make it all the way down both pattern pieces.) I had lots of pale pink fleece, so that became a sleeve and part of the front; I was hemming and hawing about how much of it to put on the front when I realized the fabric had a stain on it. So it was cut where it is to avoid using the stained part. Here’s the process I used to assemble the front. The pattern piece was meant to be cut on the fold, so I traced it and taped the halves together. 2. I laid the fabric pieces out and moved them around until the front pattern piece was covered. 3. I pinned the pieces together wrong sides together. I used lapped seams to attach them, which I had read somewhere was a good way to do non-bulky seams on fleece and other non-raveling fabrics; you just sew the pieces together wrong sides together, trim down one seam allowance, and sew the other seam allowance down over it. 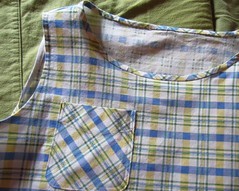 Similar to flat-felling, but easier because you don’t have to fold the edge of the seam allowance under. There is seriously nothing Shelby likes more than cutting out fabric. This whole process took HOURS and she sat there and watched intently the entire time. She looks relaxed here because I was taking pictures rather than cutting; as soon as I started working with the fabric again, she was up and studying what I was doing. 4. I placed the pattern piece on my newly-pieced fabric, pinned, and cut. The piecing on the back is simpler, in large part because cutting this out took forever and I was tired and ready to move on by the time I got to the back piece. As I wrote above, at this point I wasn’t really taking the project seriously and trying to do my best work on it. But my view of it changed when I tried it on after putting the black band on the neck edge. It just all seemed to work much better than I had expected. I had been planning to do a white hood and skip the ears, but it suddenly seemed very important that I make a black hood with ears. This is a double layer of the leftover Blizzard fleece from my partner’s cycling jersey, so it is WARM. Side note here: between my scrap quilting and my adventures in colorblocking items of clothing, I think a lot about how best to combine different fabrics. The issue for me is that I love to use scraps to make things–it’s cheap and fun and creative and interesting–but I don’t want the things I make to look “scrappy” in the “scrappy quilt” sense of the word. I want them to look put together and coherent, not random or disorganized. And one way to do that, I’ve found, is to use a very limited set of colors, as I’ve done in this hoodie. So I decided not to include the white and orange fleece remnants I had. And I kept the sleeve colors the same as the front pieces they were next to so that they would look connected, not random. As for the pattern, I sized down a bit as it was pretty oversized, and the fit is fine. I’m always a little bit wary of unisex patterns because they usually involve some weird fitting issue due to the pattern company’s attempt to fit everyone in the world with one pattern. Usually it’s linebacker shoulders, but in this one the only problem I have is that the sleeves are a little bit looser than I would like. I get a draft up them, so I might try to overcome my aversion to mending and narrow them a little from the elbow down. ETA: I did take in the sleeves, and the fit is MUCH better. I tapered from the shoulder because a whopping 3″ needed to be removed at the wrist and the look and fit of the entire sleeve is much improved. I’m really happy with how this project came out, and I’ve been wearing my new hoodie pretty much constantly since I finished it. I have a feeling this isn’t going to be the last colorblocked fleece I make this winter. I hope you’re all staying comfortably warm in fun and colorful ways, and I will be back soon with some nature-y pictures I’ve been accumulating and some fun news as well. ETA: I have linked this post up to Scraptastic Tuesday over at She Can Quilt. The gun that is introduced in Act One . . . . Sorry to have disappeared on you folks! I keep doing that, don’t I? I’m going to have to get a regular weekly-or-so thing going again . . . . Anyway, the good news is that I am better at sewing than I am blogging, and work on my Destination Happy and Healthy collection has been coming along well. You’ll recall that I wanted to make a slightly-slouchy turtleneck using this vintage pattern and some black cotton knit I got from SCRAP. What I was going for was a top with lower armholes, a looser fit, and a softer, less constricting neck than the base-layer-type turtlenecks I see in stores. I wasn’t sure how much ease I’d want in this, so I tried to err on the side of more–about 5″. That was pretty close to perfect; I just increased the seam allowance a bit on the side seams to get it just the way I wanted it. 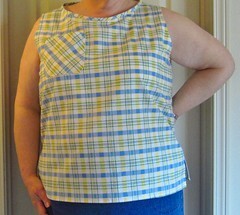 I also shortened the top and raised the shoulders so that the seams weren’t halfway down my upper arms. And the collar piece was just ridiculously long–something like 13″, I guess for those women with “swan-like necks”?–so I shortened it, folded it in half, and sewed both edges to the neck of the top. Dropped shoulders still dropped, just not as far. Loose, comfy fit, but not sloppy. Win! I’ve also finished my black jumper! My goal with this was to make a plain black dress that I could wear with a blouse or turtleneck underneath (and maybe leggings also) and accessorize with my VAST collection of hefty “statement” necklaces (see a small portion of said collection in the top photo). Which I seriously love but never get to wear because I don’t have anything plain enough to serve as a good background for them. I’ve had the lightweight, stretchy black denim for this in my stash for a couple of years now, but I’ve been putting off making it, I think because I was afraid it wouldn’t work. But we have a success! I was surprised when I first took the pattern out of the envelope–I had already cut it and had totally forgotten. I suspect that project was a wadder; this dress is fairly fitted and I had cut out a 20, which would have been too small. This time, I graded up to a 22 at the bust and hips, 24 at the waist, and the fit was right on. This is a really simple style, but it took some time to complete because the denim frays like you wouldn’t believe, and I had to finish all those long, long seam allowances. I didn’t want to use my usual French seams because of the bulk of the denim, so I chose two different finishes: for the princess seams front and back, I pressed the seams open, folded the seam allowances under, and stitched them down about 1/4″ from both sides of the seams. I also changed the back zipper from a lapped to a centered style so that I could approximate the look of the topstitching on the back seam as well. You can see some zig zagging there; I initially hoped that would be enough to tame the fraying, but no way. I inserted pockets of black rayon-poly into the side seams (YAY POCKETS), then bound the seam allowances with some bias fabric strips I had cut the wrong size some time ago and never used. I’m pretty sure I was the only one in the class that didn’t think it was weird, but it reminded me of a Mid-Century Modern walking tour I had done not too long before. I was thinking of that black jumper as I was making it, and then I remembered that I still had some of that fantastically-soft purple knit in the stash. So obviously I had to make a purple turtleneck to go with my black dress and purple glass necklace. AND, as if that wasn’t enough, I’ve also taken my first stab at making leggings! Which . . . didn’t work out so well. I need to take them in at the waist and, I suspect, add some elastic to the yoga waistband, so I’ve set them aside for now. I’ve still got about 2 yards each of the black and the purple knits, and definitely want to turn those into leggings once I have a pattern that works for me. I’m going to have SO MANY cozy warm layers to wear this winter! I’m really pleased with how my fall sewing plans are progressing. I’ve now got 6 wearable items done! Next up may be the vest, now that I have the turtleneck I wanted to wear under it. I hope that your creativity is flowing in dramatic (and well-fitting) directions. ETA: I have linked this post up to Crafty Quilter’s October UFO Linkup. Banks of the Columbia River on a warm late-summer evening . . . good place to ponder what to sew. I have this terrible conflict when it comes to making sewing plans. On the one hand, I want to be free! Free to follow my muse wherever she leads! I am a feather on the breeze! Etc., etc. On the other hand, I really like sewing with other people, even if only online. Sewing is usually such a solitary thing, and it’s so fun to do it with a supportive group for a change. I’m a member of several sewing groups on Facebook and one of them is hosting a sew-along with the theme “destination.” You make 8 items (one of them can be an accessory) between August 15 and December 15 and post them in an album in the group. Your destination can be a real place you’re going to, an imaginary place, somewhere you’d like to go, whatever. I thought I might give it a try. I’m really feeling these days as if I’m turning a corner in my life. I’ve had a pretty lousy couple of years, and I’m working on making things better. As I’m hoping to be employed soon, I’m going to need some new work clothes, as well as some things for hiking and walking outside in the cold. And I really, really need to keep my energy and momentum going. I need to be excited about the future I’m working toward because, you know, this is all really DAMN HARD WORK. So, off we go, destination: Healthy and Happy! Circle skirt. I taught my circle skirt class last Saturday at SCRAP and worked on this in the class. It’s some synthetic mystery fabric with a nice brushed finish to it. Love the colors! Black jumper. I keep promising to make this and it doesn’t happen. This time it will. The fabric is a lightweight denim with a bit of stretch. Brown flannel shirt. I got this flannel from the Goodwill in Newburg, OR, last spring. 2 yards for $1.99. I normally despise brown, but the colors in this are so pretty and I love the folk art-y style of it. I cut this out last Sunday and was short on fabric, so I used some of this green flannel as well. I’m doing view A.
Denim shirtdress. I got this fabric from SCRAP with the intention of making an overalls-type dress, but I reconsidered and decided to make something a bit less cutesy and more work-appropriate. I’ve used this shirtdress pattern before and it was a winner, so I’m trying it again with this lightweight embroidered denim. Red vest. This is the leftover stretchy fleece from the cycling jersey I made for my partner a few years ago. The pattern is from SCRAP. Still undecided on the lining, but the current front runner is a white cotton jacquard from the stash. I’m thinking it needs snowflake appliques, too. Fleece hoodie. Is this fabric great or what? It’s a remnant from SCRAP, so it’s going to be combined with some other remnants to make the hoodie. Purple vest. I haven’t decided which of these fabrics to use, but I’m leaning toward the purple tweedy stuff. Both are mystery synthetic remnants from SCRAP and whichever one I choose will be paired with this black fabric (poly/rayon, I think) from the stash. Black turtleneck tunic. To be worn with the vest and lots of other things. Fabric is a nice cotton knit I found at SCRAP last Thursday; there’s enough of it to also make a cardigan, if I can find a pattern I like. 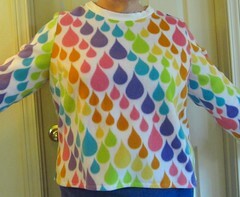 The T-neck pattern is from SCRAP, too. Maroon dress. I don’t know if this style will work on me, but I love the cool modern look of it. The fabric was a lovely surprise–I bought it years ago for making bags and had no idea I had nearly 3 yards left. It’s the thickest, softest corduroy you ever saw in your life. So, that’s 9 projects (10, if you count the black knit cardigan) and I only need 8 for the sew-along, so I have a little flexibility. I am not a fast sewer, and some of these will be somewhat complex, so this is pretty ambitious for me. Even if I don’t finish, though, I expect to come out of it with some sharp new clothes. As of right now, I have the circle skirt hanging up while I decide whether or not to hem it. The brown flannel shirt and denim dress are cut out and ready to sew; I think I’m going to get going on the latter, as it’s about 95F here and I can wear it right away. I leave you with a picture of Shelby demonstrating the proper use of a scrap of embroidered denim that your mom has given you to play with. Off to sew. Have a great weekend, all!